Wouldn't it be nice to find an autograph letter in a book? In "A Talk Over Autographs," ATLANTIC MONTHLY, April, 1895, George Birkbeck Hill wrote," Of my own collection, I have no anecdotes to relate. No such luck ever befell me as befell Mr. Fields, who, in a book picked up at a stall, found inserted an autograph letter of Johnson's (p.450)." I, too, have been blessed with finding a letter inside of a book. It was a piece on A.S.W. Rosenbach hidden inside of the book, TO DOCTOR R. I am still trying to discover when and where Joseph Carson presented this address on Rosenbach. Ironically, a G.B. Hill letter that I picked up in an ebay auction concerns the very same Samuel Johnson letter that James T. Fields found in a book. Frank Lynch, webmaster of the Samuel Johnson Sound Bite Page,clued me in to the G.B.Hill letter, which was included with a dilapidated set of Hill's edition of BOSWELL'S LIFE OF JOHNSON. Since I already had a few of the books Hill wrote, I wanted the letter. Researching this G.B. Hill letter, which was not included in his daughter's book, THE LETTERS OF GEORGE BIRKBECK HILL, London, 1906, is an on-going project. 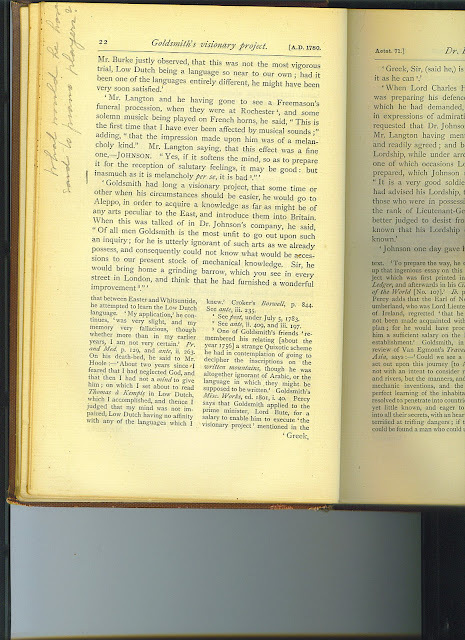 I was able to identify the Johnson Letter; but I was unable, at first, to discover how the American book collector, who still remains unidentified,was aware that Fields was the one who found the letter. Researching Hill's letter deserves a separate blog posting of its own. In Nov 2004, I acquired one of George Birkbeck Hill's autograph letters. 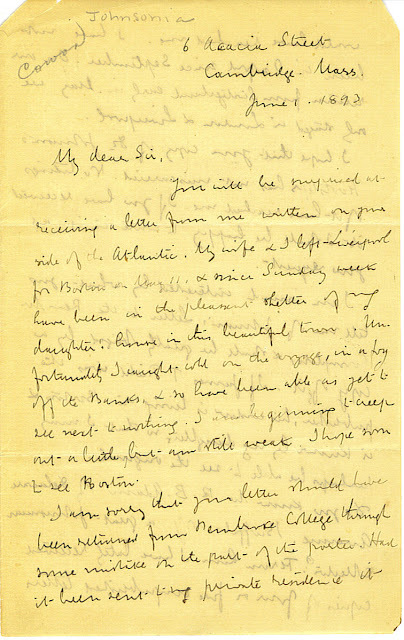 George Birkbeck Hill wrote this letter to an unidentified American book collector while he was staying at the home of his daughter, Mrs. Ashley, in Cambridge, Massachusetts. In the top left corner, a previous owner wrote the word, "Johnsoniana," and the name, "Cowan." 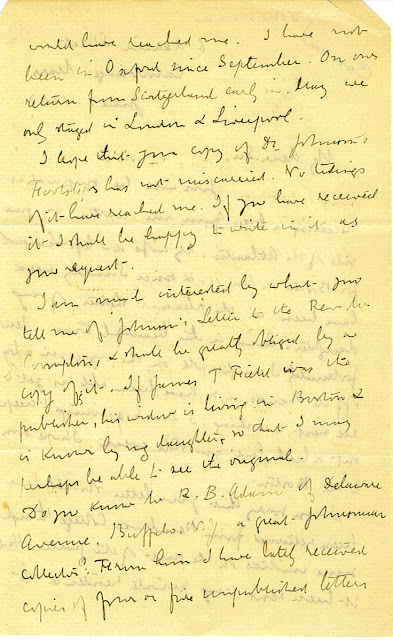 In this letter, Hill reveals his interest in a Samuel Johnson letter to the Reverend Compton that, according to the American book collector, an American publisher had acquired. This SJ letter was not identified in Hill's 1892 edition of THE LETTERS OF SAMUEL JOHNSON LL.D..
You will be surprised in receiving a letter from me written on your side of the Atlantic. My wife and I left Liverpool for Boston on May 11, & since Sunday week have been in the pleasant shelter of my daughter's house in this beautiful town. Unfortunately I caught cold on the voyage, in a fog off the Banks & so have been able as yet to see next to nothing. I am beginning to creep out a little, but am still weak. I hope soon to see Boston. I am sorry that your letter should have been returned from Pembroke College through some mistake on the part of the porter. Had it been sent to my private residence it would have reached me. I have not been in Oxford since September. On our return from Switzerland early in May we only stayed in London and Liverpool. I hope that your copy of Dr. Johnson's Footsteps has not miscarried. No tidings of it have reached me. If you have received it, I shall be happy to write in it as you request. I am much interested by what you tell me of Johnson's Letter to the Rev Mr Compton & shall be greatly obliged by a copy of it. If James T. Fields was the publisher, his widow is living in Boston & is known by my daughter, so that I may perhaps be able to see the original. Do you know Mr. R.B. Adam of Delaware Avenue, Buffalo, N.Y. a great Johnsonian Collector? From him I have lately received copies of four or five unpublished letters of Johnson. The story told by Sir Walter Scott of the altercation between Johnson & Adam Smith has been shown in every particular to be untrue. It was no doubt one of those numerous inventions in which the Scotch might revenge for Johnson's wit. P.S. Your letters were forwarded to me from England, having I think been sent first to Switzerland. My son who forwarded them had taken off the envelope, so it is unknown how far they had traveled. This explains my delay in sending you an answer. The SJ letter referred to in this correspondence is the letter that Samuel Johnson wrote to the Rev. James Compton on Oct. 24, 1782. Compton was a Benedictine monk who, after reading Johnson's Rambler essay #110, wanted to convert to the Church of England. Johnson assisted him monetarily upon his arrival. This letter first appeared in print in the ATLANTIC MONTHLY, Vol 8 No. 48, Oct. 1861,p.442,in "My Friend's Library," an article about a woman's library of choice books, many of them containing inscriptions from renowned authors of the day. The letter to Compton was found "in a well-preserved quarto copy of "RASSELAS," with illustrations by Smirke, which my friend picked up in London a few years ago." In 1877, "My Friend's Library" was published in UNDERBRUSH, a collection of articles James T. Fields had contributed to the ATLANTIC MONTHLY. The SJ letter to Compton was printed on page 17. In its Oct. 1, 1877 review of UNDERBRUSH, THE LITERARY WORLD, another Boston periodical, speculated that the library described in "My Friend's Library" belonged to Mrs. James T. Fields. JAMES T. FIELDS: BIOGRAPHICAL NOTES AND PERSONAL SKETCHES , Boston, 1881, was published anonymously by Annie Adams Fields shortly after her husband's death . There was no mention of Johnson's letter to Compton in the book. In the March 1888 issue of SCRIBNER'S MAGAZINE, in "A Shelf of Old Books," Mrs. James T. Fields first revealed the true provenance of the books described in "My Friend's Library." She admitted that the library belonged to her late husband, James T. Fields. In 1892, Hill published THE LETTERS OF SAMUEL JOHNSON L.L.D.. Johnson's Oct 24, 1782 letter to Compton was not included because Hill was still unaware of its existence. Sometime shortly afterwards, the American book collector wrote a letter to Hill, informing him that an American publisher, possibly the late James T. Fields, had been in possession of the SJ letter to Compton (see GB Hill's June 1, 1893 letter). A facsimile of the Compton letter was first published in "A Third Shelf of Old Books," SCRIBNER'S MAGAZINE, Sept 1894. This article, and two other articles written by Mrs. Fields, were published in A SHELF OF OLD BOOKS, New York, 1894. 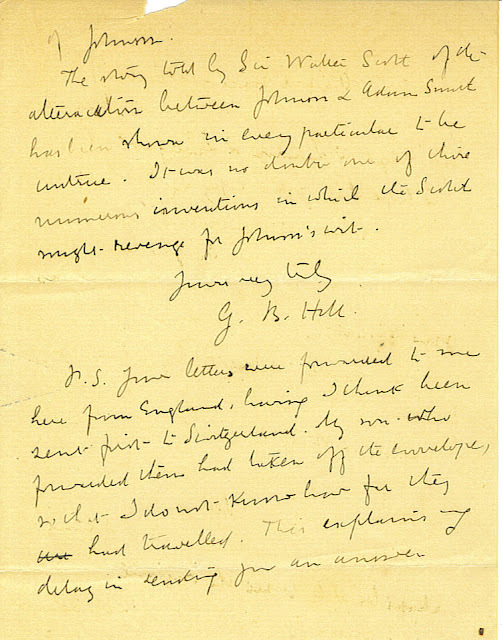 In his April 1895 ATLANTIC MONTHLY article, "A Talk Over Autographs," George Birkbeck Hill first publicly revealed that he knew Fields was the one who found the SJ letter; however, Hill said Fields found it in a book stall, and not in a bookshop. This article was later published in TALKS ABOUT AUTOGRAPHS, London, 1896. George Birkbeck Hill printed a copy of Johnson's letter to Compton in JOHNSONIAN MISCELLANIES, New York, 1897, Vol. II, P.453. In his footnotes he cited the Sept 1894 SCRIBNER'S MAGAZINE article, and UNDERBRUSH, Boston, 1877. Hill also corrected himself by saying that Fields found the letter "in a copy of RASSELAS purchased at a second-hand bookshop." In 1906, Lucy Crump published her father's letters in THE LETTERS OF GEORGE BIRKBECK HILL, London. Hill's letter to the unidentified American was not included in the book. After Mrs. James T. Fields died in 1915, the SJ letter to Compton was given to Harvard University. Although I have learned just about all I can about Mr. James T. Fields and George Birkbeck Hill, I have learned very little about the American book collector Hill wrote to. I know he was a book collector because he mailed a book to Hill to inscribe. He either owned or had access to several of Hill's books, so he was probably a Samuel Johnson collector. He had a copy of Hill's FOOTSTEPS OF DR. JOHNSON, which was lost in the mail. He was aware that Johnson's letter to Compton was not included in Hill's edition of Johnson's letters. He was a reader of literary magazines. Unless he was the recipient of insider information, he had to have read Mrs. James T. Fields' April 1888 SCRIBNER'S MAGAZINE article, "A Shelf of Old Books," as well as either the Oct 1861 SCRIBNER'S MAGAZINE article, "My Friend's Library," or its inclusion in UNDERBRUSH, Boston, 1877. The book collector evidently had a very good memory. As mentioned previously, a former owner wrote the word "Johnsoniana" and the name "Cowan" on the top of the letter. The only Cowan I know is Robert Ernest Cowan, the California bibliographer. I know he attended UC Berkeley from 1882 to 1884, and became a San Francisco bookseller in 1895; but where was he from 1885 to 1895? Ward Ritchie once said that Cowan had a fantastic memory. He also said that everyone called him by his last name, "Cowan." On the negative side, there is no record of correspondence between Cowan and Hill at UCLA, its off-site location, SRLF, or at Pembroke College in Oxford. There were no Johnsonian books in the Robert E. Cowan Library at UCLA. In the books that came with the Hill letter, Hill's edition of Boswell's LOJ, the bookseller's ticket of Jerrold Nedwick, Chicago bookseller, was pasted on the rear endpaper of the first volume. Nedwick was prominent in the early 1900s on. There are no other marks of provenance in the books; however, there are six short instances of marginalia, one of which is included below. You can view the other marginalia here.